Pangaea Technologies Inc. can help your website achieve instant results through Pay Per Click advertising utilizing the popular Google Ad-words Campaign System. Our experienced search engine marketing team will create campaigns targeted towards your industry keywords and constantly monitor and adjust the campaign for maximum efficiency and profit. We aim to provide clients with Return on Investment by helping drive sales and leads through Pay Per Click advertising while only paying optimal prices for targeted clicks. Whether you wish us to maintain and improve your current Pay Per Click advertising or create a new campaign for your website, we have the skills and experience required to successfully manage your campaign. This free's up your time and allowing you to concentrate on your business or other projects. 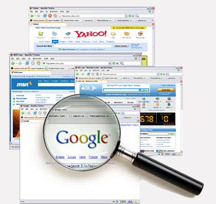 We research and analyze keywords related to your business and examine the popularity of these words. This analysis establishes the relevance of searches conducted by individuals, the competition for the keywords and an estimated cost per click of selected keywords. We create an optimal text based ad for your PPC campaign and recommend or create landing pages for these ads. Campaigns may have multiple landing pages and we ensure that each landing page has been optimized for the user. A budget will be setup for each campaign. A daily budget will be setup and individual keywords will be assigned a PPC rate. With nearly real time reporting, we can identify what works and what doesn't. The campaign will be monitored and adjusted to maximize click through's while meeting budget restrictions.